Time for Mr Angle Grinder Mike! 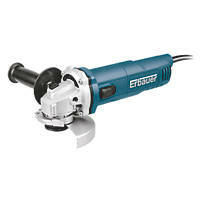 Bought one from Screwfix a couple of weeks ago for another job. I anticipate track would need to be cut on the red lines to maintain a minimal reverse curve effect. My measurements suggest the centre to centre spacing would be pretty damn close to that obtained when using 2 R3 points. 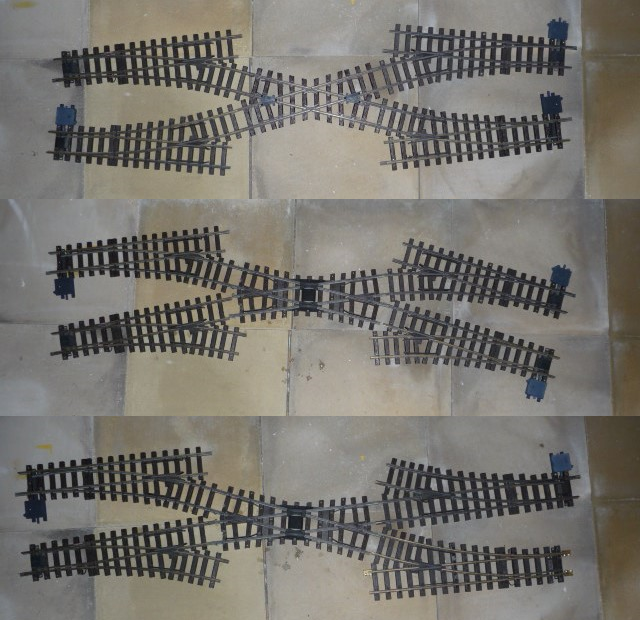 as a facing/trailing junction. At around 5mm wider it would be small enough to not be noticeable. 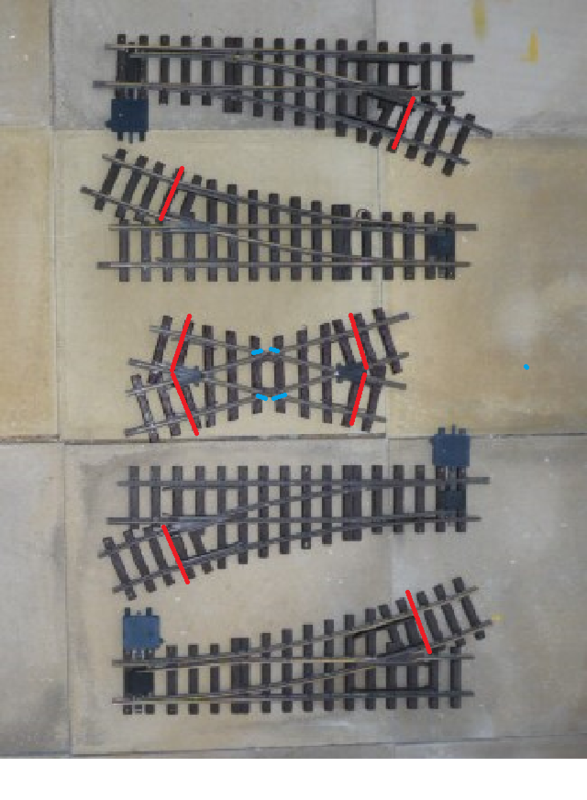 A small insulating cut would be required at the blue marks (to prevent wheel treads shorting out to the other track) as well as removing the brass connecting plates below to isolate the two tracks from each other. Appropriate jumper leads would be needed for the four brass rails forming the central diamond. If I decided to attempt this I would mount the whole thing on a sub base for ease of construction and rigidity. Had more thoughts today. Four R5s and a 30 degree crossing would require virtually no work. OK the spacing would increase somewhat, but …...… anyone got any R5s going cheap? Why, pray, is this page covered with virtual snowflakes? Many, many years ago I made one of these for '00' using peco track as a cut & shut job. It looked terrible but it was in the fiddle yard out of sight. It worked perfectly & never let me down. Looking at your Red Lines, have you left enough room for Fishplates by the Frogs? Just a little Tip Massoth Track Would work and you can even cut them down a tadge to make use of space use the most efficient. Would also help to keep things stable without any sub base. Jon my initial thoughts were to remove all the point rail up to the frog and reshape the rail ends of the crossing to fit. Having re-examined the photos of the propriety offering I wonder if I could just cut some straight brass rail and remove segments in a similar manner, giving a continuous piece from point to point. Would save the cost of destroying a crossover and probably much soldering. How does it look when you connect the crossing to the points ? With out cutting anything ? Depending on internal (underneath) power connections that would be a better bet allowing return to original if required. Here you go Sean. Bottom two pictures employ a 22.5 degree crossing for comparison. Ok Hmmmm .. so Four R5s and a 30 degree crossing would require virtually no work....I think yor right with that. Thanks for the visual .